Chester County, PA – Gold medalist Suzy Stafford and her new partner TTE Tea Time, owned by Wendy O’Brien of Trout Walk Farm, bring home the Advanced Championship at the Katydid Combined Driving Event held in Windsor, SC. Suzy made history in 2005 when she won the first Individual Gold medal at the World Pony Championships for the United States. She has continued to medal at the World Championships in 2007, 2009 and most recently in 2011 winning the Individual Silver for the United States. Suzy has high hopes for her new equine partner “Trae”, an 8 year old Morgan Gelding owned by Wendy O’Brien. Stafford was thrilled with her performance at the Advanced level after a stellar performance in all three phases of the tough competition. “This was his first showing at the advanced level. Even though I was a bit hesitant to move him up, I thought he needed the exposure. Boy was I wrong; he was cool calm and competitive and proved to me that he has what it takes for the FEI stage. I was ecstatic with his performance!” says Suzy, smiling from ear to ear. “Trae” is a natural competitor, he knows when to “turn it on” and that is something you cannot train. They have to be born with it,” Stafford says. 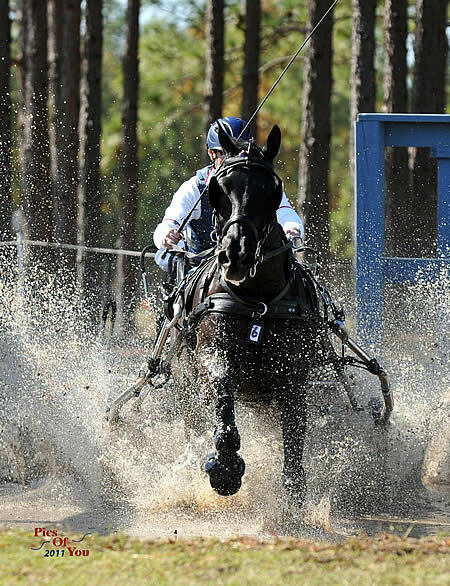 Aiken, SC (November 10, 2011) – Chester Weber, the eight-time USEF National Four-In-Hand Combined Driving Champion, drove away as the winner of the Four-In-Hand Advanced Horse Teams with a new team of horses during the 2011 Katydid CDE in Aiken, South Carolina. Weber’s new team, including three horses owned by Jane Forbes Clark and two by Weber, proved their future star power by winning the dressage, marathon and cones during the event. Caletta’s full sister, Celina, also made the team and the 10-year-old competed all three days in the left wheel. “The other two were Boy W and Jane Clark’s Splash and I drove them together in the lead of the marathon,” Weber said, adding that he feels he has added great depth to his stable with the combined talents of Team Weber and Team Clark. Lexington, KY – Scott Monroe (Sharon, CT) and his black Morgan gelding Bethesda After Dark (“Shadow”) held onto their marathon lead and after Sunday’s cone phase won the USEF National Single Horse Championship at Katydid, with a score of 132.39. Kim Stover and Laughlin – fifth after the marathon – surged ahead and took second on a score of 141.25. In third was Sara Schmitt (Bedminster, NJ) who finished on a score of 142.58. Schmitt, driving Kaboom, was fourth after the first two phases. 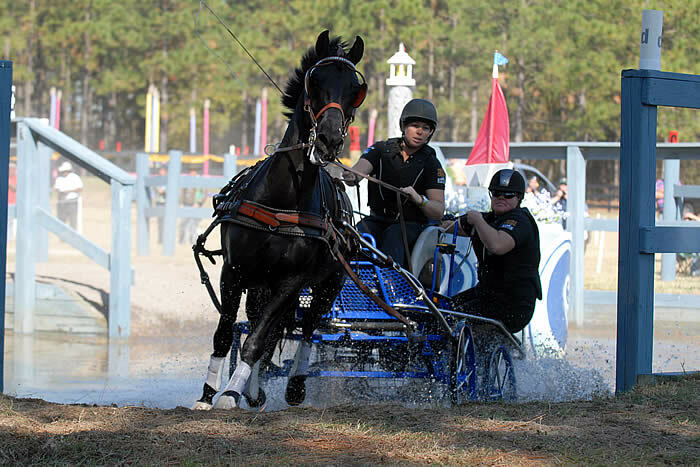 Seventeen-year-old Jan Jan Hamilton (Alva, FL), driving JAO Desperado (“Desi”), was the only advanced driver that went double clear in cones. 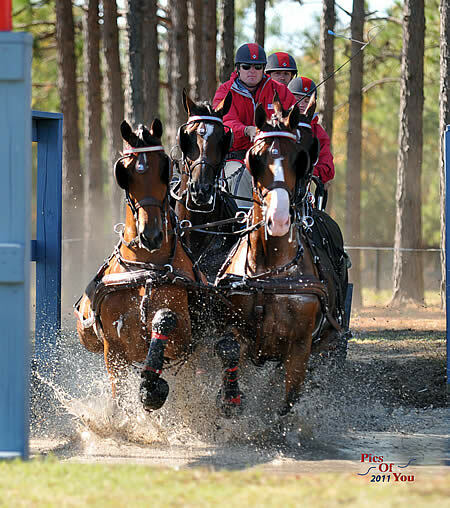 A fairly new event in the growing driving community of Aiken, this marks the first USEF National Championship held at Katydid. Complete results, as well as photographs and articles, are available on USEFNetwork.com at: http://usefnetwork.com/featured/2011DrivingNatlChamps/. For more information on combined driving programs please contact Elizabeth Staller at estaller@usef.org. Lexington, KY – Scott Monroe (Sharon, CT) took the lead on Saturday during the marathon in Aiken, SC, at the USEF National Single Horse Championship at Katydid, with a score of 123.39. Monroe was nearly 7 points in front of Olof Larsson (Ocala, FL) as they head into Sunday’s cones phase. In third place was Sterling Graburn (Georgetown, KY) who on Friday had led after the dressage competition phase. He finished the day Saturday with a combined score 133.46. Saturday’s marathon course was designed by Barry Hunter, FEI course designer who also designed the courses in Conty, France, for the FEI World Pair Championship this summer. The drivers will now turn their focus to Sunday’s cones phase – scheduled to begin at 10 a.m. ET. – and the conclusion of their quest to earn the title of National Champion. Lexington, KY – An exciting day of dressage in Aiken, SC, showcased some of the very best in the U.S. vying for USEF National Single Horse Championship honors at the Katydid CDE. After all but one of 19 horses passed inspection – Wilson Groves’ UVM Worthy was deemed unfit to compete – Sterling Graburn (Georgetown, KY) drove to the lead in Friday’s dressage competition phase, on a score of 43.09. Kate Shields (Middleburg, VA) was in second on a score of 45.87 followed by Olof Larsson (Ocala, FL) who finished on a score of 46.72. The drivers will now turn their focus to Saturday’s marathon which begins at 9 a.m. ET. Complete results are available at: http://drivingnews.us/results/results2011/Katydid/KD11-Dressage100.pdf. Visit www.USEFNetwork.com for photos, articles and information about the U.S. drivers throughout the event. Shelly Temple and groom Dottie Paul competed in the driven dressage on day 1, Katydid CDE. Photo credit: Pics of You. The cold temperatures in Windsor, South Caroline did not dampen the enthusiasm of Shelly Temple, Cooper and Harry at the Katydid CDE. Held at Katrina Becker’s Katydid Farm, the Katydid CDE featured four days of combined driving at the training, preliminary, and intermediate levels. Shelly and her new combination of ponies, reigning National Champion pony Cooper, and former National Champion Harry, finished out their season with win. Harry is owned by Jack Wetzel of Aiken, South Carolina. “The ponies continue to come together as a team,” remarked Shelly after winning dressage with a 40.22. “The boys will have a little time off then will be back to work to build on the foundation we established this fall.” Saturday saw the team, including Shelly’s husband/navigator, Fran Doto, take 4th place in marathon yet preserve their overall 1st place standing. Sunday’s cones competition featured another cool but sunny day, and a double clear round for Team Catalyst resulting in a first place in preliminary pair ponies in their second competition.